Iran’s defence minister has said his country recently carried out a missile test, days after the White House said it was looking into reports of an Iranian ballistic missile launch that may have contravened a UN resolution. General Hossein Dehghan was quoted by the semi-official Tasnim news agency as saying “the recent missile test is in line with our plans and we will not let any foreigner meddle with our defence issues”. He did not say when the test was carried out or specify the type of missile, but said the test was not in violation of UN resolutions or the 2015 nuclear accord. The nuclear deal reached with world powers does not include provisions against missile tests. When it came into effect in 2016, the Security Council lifted most UN sanctions against Tehran, including a 2010 ban on testing missiles capable of carrying nuclear warheads. The council, nevertheless, adopted a resolution in 2015 which “calls on” Iran not to carry out such tests. The US has maintained and expanded its own sanctions related to Iran’s missile programme. At the request of the US, the UN Security Council held a session on Tuesday to address allegations that Iran conducted a ballistic missile test. The council referred the matter to its committee on Iran and asked for an investigation. Iran has long boasted of having missiles that can travel 1,200 miles, placing much of the Middle East, including Israel, in range. Iran says its missiles, which could also strike US bases in the region, are key to deterring a US or Israeli attack. 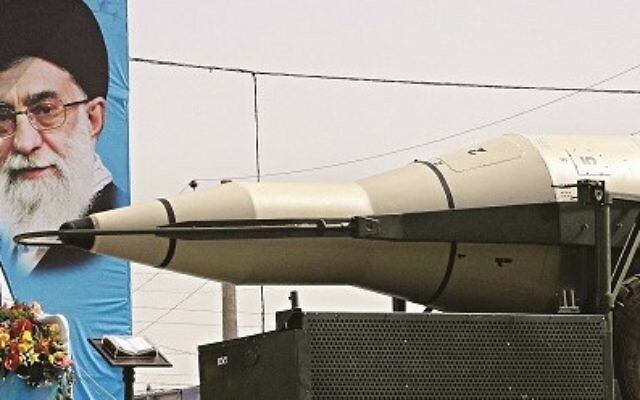 In March, Iran test-fired two ballistic missiles – one emblazoned with the phrase “Israel must be wiped out” in Hebrew – setting off an international outcry. Iranian parliamentary, diplomatic, intelligence and military officials held a joint meeting in Tehran on Wednesday in which they condemned foreign interference in the country’s defence affairs, saying Iran’s missile and defence programmes are not negotiable, the semi-official Fars news agency reported.